In the spirit of St. Patrick's Day, how about some scones? 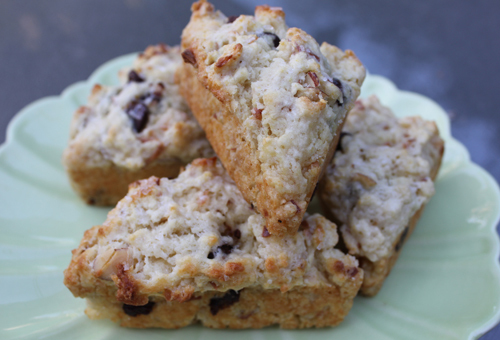 But these aren't your typical scones - they're stuffed with all kinds of goodness. They have a little bit of everything... coconut, slivered almonds, chocolate chips... what more could you ask for? Actually, the flavors are a really nice blend. They all work so well together and none are overpowering. Joy's scone recipe really is delicious. It's not too dry (I find scones often can be) but nice and flaky and perfect to go with coffee or tea. 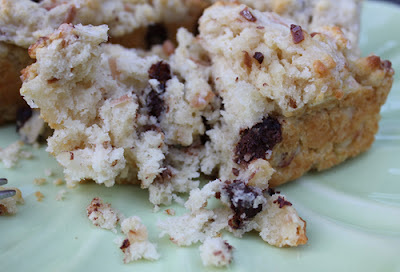 Over-flowing with chocolate, almonds and coconut. 1. Place a rack in the center of the oven and preheat oven to 350 degrees F.
2. Place shredded coconut and slivered almonds on a baking sheet and toast in the oven for about 8 to 10 minutes. Keep your eye on the coconut. It browns quickly. Remove from the oven when toasted and allow to cool. 3. Heat oven to 400 degrees F. Line two baking sheets with parchment paper and set aside. 4. In a large bowl, whisk together flour sugar, baking powder, baking soda, and salt. 5. Toss the cold butter cubes into the flour mixture. Using your hands or a pasty blender, quickly work in the butter into the flour mixture, breaking it up. Some butter bits will be the size of small pebbles, and some will be the size of oat flakes. Set in the fridge for a few minutes while you work on the next steps. 6. Whisk together buttermilk and egg. 7. Remove the flour and butter mixture from the fridge and add coconut, almonds, and chocolate chips. Whisk together and create a well in the center of the mixture. Add the buttermilk mixture all at once to the well. Use a fork to bring the wet and the dry ingredients together. Mixture will be shaggy. Lightly flour a work surface and dump the shaggy dough mixture out onto the counter. Bring together the dough with your hands into a 1 1/2-inch thick disk . Use a 2 1/2-inch round biscuit cutter to cut out biscuits. Flour the biscuit cutter if it starts to stick to the dough. 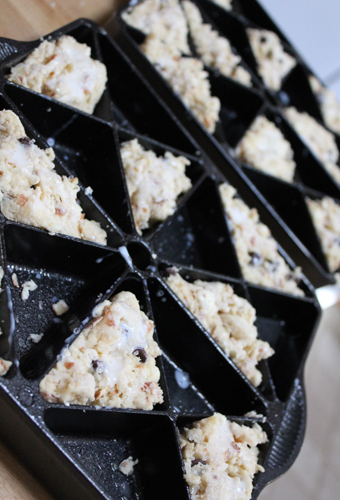 I have scone pans that I don't get to use nearly enough, so I packed mine into the spaces. I wasn't sure how much they would rise so I spaced them out a bit. 8. Place scones, about 1 inch apart, on the prepared baking sheets. Brush with a bit of buttermilk and a few pinches of raw or granulated sugar. 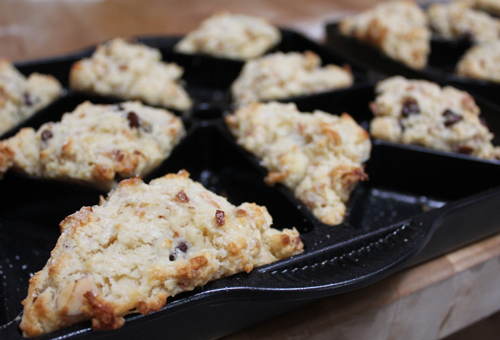 Bake scones for 14-18 minutes, until golden brown and cooked through. Remove from the oven and serve warm, with jam or clotted cream. These look amazing! 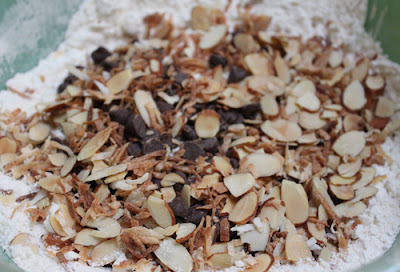 I am going to try and make these for tomorrow morning...I have everything but the almonds. I never knew scone pans existed. Might have to look into that. The scones look yummy!! Yum! These look and sound delicious! Stopping by from Made by you Monday. Those look amazing. I love a good scone. Featuring on Thursday at Bacon Time!